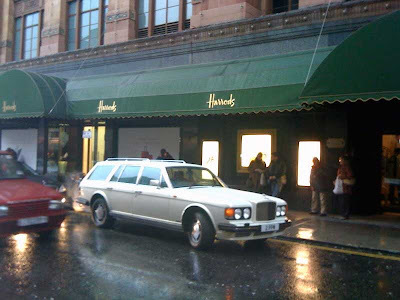 A significant contributor to Bentley Spotting Andy was doing a spot of shopping yesterday at Harrods, and take a look at what was parked out the front. 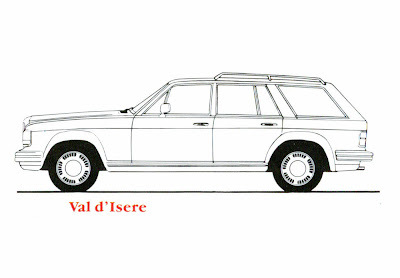 The perfect shopping car, a Bentley Val D'Isere by coachbuilder Jankel. A beautifully proportioned station wagon or shooting brake with lots of interior space for purchases. This design sketch shows the spot on proportions. 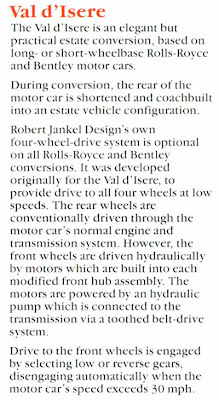 And a little more inforamtion about the car from the Jankel brochure. More more pictures of a black Val D'Isere, a yellow Val D'Isere and even a pink Val D'Isere take a look at a previous posts here. How many "val d'isere" were built ? That is a good question. I am not sure. It is presumed that a number were made for the Royal Family of Brunei, and occasionally they get spotted in London. http://bit.ly/8FK5Nd states that 8 were made, but there could be more.